I love to look at predictions that turn out to be incorrect. Not because I want to laugh at the person who made the incorrect prediction, but because I want to examine the reasons why the person made the incorrect prediction. So that's what I will do today. And the person who made the bad prediction was - me. This really isn't an Oracle OpenWorld 2007 post, so I won't label it as such. The NEXT generation of the Oracle Database product will probably be called Oracle Database 12m, where the "m" stands for "mobile." Mobile is/will be that big. It's already big in my vertical market, it's obviously big in all this Tweeter/Flickr/etc. stuff I talked about earlier, so I suspect it may eventually affect the plumbing. In this case, I'm not talking about my prediction that the 12th version of the Oracle Database product would have come out two years ago. Instead, I'm talking about what the version would be called. During my time attending Oracle OpenWorld, the letters "i" (for Internet) and "g" (for grid) were appended to the Oracle releases. I figured that as people accessed the data from everywhere, the mobile element would become more and more important to Oracle's marketing. As you will see below, I can claim that I was half right. Before Oracle OpenWorld begins, Oracle provides a special briefing to its Oracle ACE Directors. These are people who are not employed by Oracle, but who have made significant contributions to the Oracle community. Eddie Awad is an Oracle ACE Director, and was in attendance at these meetings. Although the attendees are under non-disclosure, they do end up sharing certain obvious information publicly. Awad collected these public statements from the ACE Directors and shared them in two posts, including this one. When I saw that tweet, I said to myself, "Of course!" After all of the talk that Larry has talked over the last few years, the use of the "c" designation makes sense. I claim that I am half correct because the "c" designation implies access from everywhere, including mobile devices. Of course, this designation concentrates on how the data itself is managed - and from a database perspective, that's what you really care about. In case you don't know what "c" stands for, Computerworld UK spelled it out several months ago, when Ellison stated that version 12 was coming soon. The next edition may be called 12c, with the c referring to "cloud." Oracle Enterprise Manager 12c, which was released in October, used that naming convention. Oracle has placed a strong emphasis on its cloud computing strategy of late. More official news about the new Oracle Database release may be shared at Oracle OpenWorld - perhaps tomorrow (Sunday) evening. Other than having to chase some motorists, skateboarders, and walkers off the closed San Diego Freeway, few problems were reported in the early hours of "Carmageddon II," officials said on Saturday. Danged whippersnapper skateboarders. Get off my freeway. 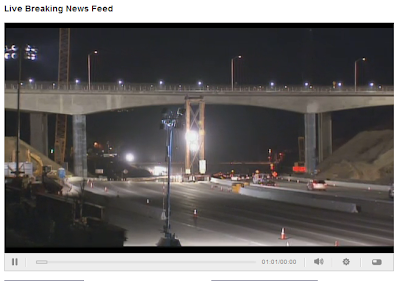 Work has progressed since yesterday evening (screen capture from My Fox LA as of 9:35 this morning). Still no sign of OJ or Amanda or Perez or Harvey. 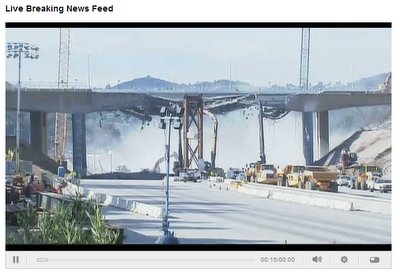 The local Fox station in Los Angeles is providing a webcam all weekend showing live CARMAGEDDON 2 STORMWATCH coverage. This is what the scene looked like at approximately 9:50 pm Friday evening, or about two hours before the 405 freeway is shut down entirely. After midnight, they'll start tearing down the bridge that is pictured. Despite my previous warnings, neither Amanda Bynes nor OJ Simpson have been sighted in the area. Starbucks' Verismo - landscape changer, or me-too item? What should you do if you have a successful business, and you've developed a new product that will undercut your existing one? In my view, you should introduce the new product. If you don't cannibalize your own sales, your competitors will. Which brings us to Starbucks. Over the past few years, Starbucks brick and mortar establishments have had to deal with competition from high-end "make your own coffee/espresso at home" machines. Bunn, Flavia, Nespresso, Keurig - there are a number of machines that you can install in your home or office that could keep you out of a Starbucks store. Starbucks' first volley was to introduce its line of instant coffees. Now they're coming out with their own machines - the Verismo line. The name is not new. The in-store Starbucks machines have been called Verismo for years. However, until now you haven't been able to buy a Starbucks-branded single-serving coffeemaker for use at home (although you could buy Starbucks coffee and put it in your Keurig machine). Initial reaction to the Verismo is similar to the reaction of an Apple fanboi to the latest insanely great phone. There are reports that the first batch of Verismo machines is selling out. This may not be the death knell for Green Mountain (the Keurig people) or Nestle (the Nespresso people) or the other players. These high-end coffee/espresso machines are - well, they're high end. If you're plonking down $200 rather than $20 for a coffeemaker, you're going to be a little picky about what you acquire your device. So while Starbucks will undoubtedly be a player, I don't think Nestle or Green Mountain are going to close their doors any time soon. Or at least not because of Starbucks. Nestle is always going to have its opponents, and the Nespresso technology has been relaunched for something that Nestle opponents love to hate - BabyNes single serving baby formula delivery system. At first I thought this was an Onion story, but this is actually a press release on Nestle's website. Starbucks would never do that. They're, like, preserving the rainforest and stuff. While people like me concentrate on issues such as how to deal with a celebrity fender bender during CARMAGEDDON II STORMWATCH , others concentrate on things that may be more important. Governments do a lot of wonky things that most citizens don't give a hoot about. But certain isolated segments of the population really really care about it. The law passed last August imposed an across-the-board $1.2 trillion cut – so-called sequestration – if the Super Committee [failed] to come up with an alternative plan by Thanksgiving. Those cuts will hit defense and domestic programs equally. Well, no agreement was reached by the deadline, and no agreement is going to be reached in an election year, so the cuts are set to take effect in a few months. While procurement officials and government contractors are talking about sequestration non-stop, the term really hasn't penetrated the rest of the country yet. Republican Presidential candidate Mitt Romney criticized President Obama on Thursday for signing the budget sequestration plan, saying it is a threat to Virginia’s economy and national security. Speaking before veterans at an American Legion hall in Springfield, Va., Romney said sequestration would lead to 136,000 lost jobs in the state. He also said the cuts would leave the United States vulnerable at a perilous moment in international affairs. As I write this, I don't know if Obama has responded, or what Romney will say on other stops on the campaign trail. But even if neither candidate says much more about sequestration before the election, the winning candidate will have to deal with sequestration after the election. Either some last-minute deal or workaround will be struck that avoids the cuts, or the cuts will take effect on schedule. Because any last-minute deal would be, by definition, last-minute, there will be a lot of business uncertainty over the next few months. If you're thinking of starting a new government contracting business, now is not the time. I had a very busy month in October 2009. While I spent time researching things in my former proposal world, I fulfilled my product management duties by attending Oracle OpenWorld 2009 and my company's User Conference, before publicly announcing that my interest in proposals was more than academic. Although I have left the product management world behind, I have retained one item from those days - the building blocks that I acquired at Oracle OpenWorld 2009. The blocks, of course, were meant to illustrate that Oracle is able to provide all of the building blocks that you need to create a business solution. I, however, have used the blocks as toys during tense proposal periods. Take your ideas, concepts or program features to the next level with eye-popping Full Color Promo Blocks. Our Full Color Promo Blocks come on white blocks and include one full color digital decal on one side and are individually poly-bagged. A second digital label or screen printing is available on the second side at an additional cost. You'll notice that the standard product comes on white blocks. The blocks that I obtained at Oracle OpenWorld 2009 were red. Oracle OpenWorld 2012 starts next week, and if this is your first time attending Oracle OpenWorld, let me clue you in on something that you will soon discover: Oracle kinda sorta likes the color red. I don't know if Oracle Technology Network still hands out building blocks in the post-Kestelyn era, but I'm sure that they'll have something good for you if you go by their tent. And if you're technically inclined, see what the AppsLab has planned for the week. P.S. Yes, the hashtag is #oow, not #oow12 or #oow2012. Perhaps this is meant to appease four digit year fans like myself, or perhaps it's an attempt to make #oow a permanent part of your existence. Get the red sunglasses. P.P.S. "Get the red sunglasses" actually refers to something completely different, but it's not appropriate for me to share it yet. Expect me to share it later. And no, it doesn't have anything to do with another job change. Normally my predictions are way off, but I recently made a prediction that was spot on. On Wednesday afternoon, I predicted that the National Football League referee labor dispute would be settled, primarily due to pressure from inconvenienced degenerate gamblers. Within a few hours, a settlement had been reached, and I'm convinced that it was because of gambler pressure. Well, it's good that's out of the way, allowing those of us in southern California to turn our attention to the catastraophic events that will occur this weekend. 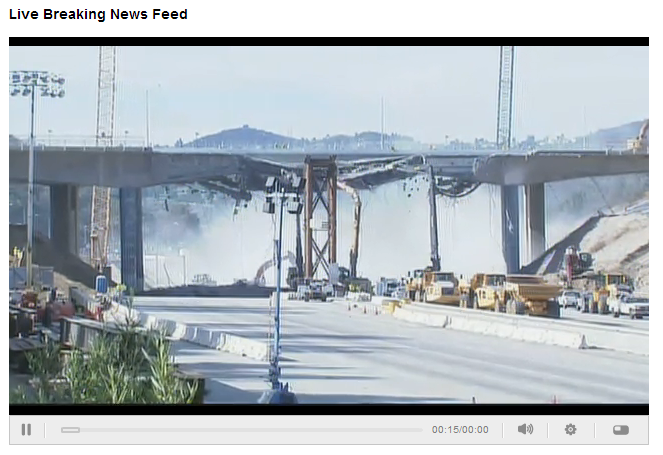 For those who don't know what I'm talking about, you should be aware that for the second time in two years, a critical stretch of Interstate 405 will be closed this weekend. At the same time, there is a slight chance of rain. This, as anyone who watches local news in Los Angeles will tell you, pretty much means non-stop, crazed coverage. There will be reporters in Westwood and other locations, standing next to major traffic routes, reporting LIVE on everything that is going on or not going on at their locations. And if it rains, they will be wet and will show LIVE pictures of puddles of water. Riveting. Yes, I know that the original Carmageddon turned out to be a dud. And I know that I personally live fifty miles away from Interstate 405, and theoretically shouldn't be affected by the stuff that goes on in El-Lay. Why? Because CARMAGEDDON II STORMWATCH will take place in Los Angeles, and frankly we were lucky the last time. When a freeway closure and rain occur at the same time, any other event, albeit small, may be enough to throw Los Angeles - and all of the southwestern United States - into cataclysmic apocalyptic chaos. And if something big happens, the devastation could be severe. Imagine that O.J. Simpson is released from a Nevada prison on Friday. Simpson, who would presumably be unaware of CARMAGEDDON II STORMWATCH due to his extended "stay" outside of the state of California, arrives in Los Angeles just in time for the weekend. Now imagine that, at the same time that Simpson is driving his late-model Ford vehicle in the neighborhood of Sunset and Sepulveda, noted erratic driver Amanda Bynes happens to be at the same location. If this happens, the two cars are bound to connect because of celebrity attraction. You can imagine the devastation that would ensue. But by preparing for this occurrence now, we will be able to deal with it. First, remain calm. Try to refrain from tweeting in ALL CAPS - unless, of course, you are tweeting the words CARMAGEDDON II STORMWATCH. Second, in this instance leave the reporting to the professionals. I know that most celebrity events benefit immensely from the presence of "citizen journalists." However, because of the danger of multi-state gridlock, this is the one time when you want to leave the reporting to Perez Hilton and Harvey "I Do Not Fear Death" Levin. Remember that even if Perez and Harvey get into a fight themselves, they are professionals and will be able to continue reporting everything that goes on. Third, try not to take sides between the two celebrities. Yes, I know that Bynes is (relatively) young and still cute (at least until the meth damage sets in). However, do not forget that O.J. was NOT criminally charged with murder, so don't let that enter your thought processes. And really, would you want to anger the fan base of either of the celebrities? Just keep your mouth shut and observe. Fourth, and most importantly - if Fred Goldman (yes, he's still around) shows up on the scene, give up all hope of the survival of our civilization. In that case, we're done for. Before I launch into this subject, a few caveats are in order. First, the piece that I'm about to reference appeared at the Procurement Leaders website. Procurement equals buying. For the last 15+ years, my job has involved some aspect of selling. Will social media change the way we buy? Twitter, Facebook and blogs have changed the way many live their lives. A new class of smartphone junkies has appeared, their faces lit up with the soft glare of screens which document their existence on photos that are shared to the world. And let's face it - I probably share more with people today than I would have shared fifty years ago. Can you imagine me running around in 1962, posting these paragraphs on laundromat bulletin boards? Webb then notes that Chief Procurement Officers (CPOs) are not necessarily following this trend. Maybe they're using LinkedIn, but procurement officers aren't always (using the term in vogue these days) "transparent." It would be fascinating to see negotiations or tenders conducting online. Perhaps the hashtag #thisismyfinaloffer may have more credence if the speaker is accountable to the general public. Again, I'm assuming that Webb is talking about commodity procurements here. But even here, I see a basic problem with Webb's suggestion of more transparency in procurement. The main issue is that the Chief Procurement Officer is not the only party in the transaction. And there are valid reasons why the other party won't agree to transparency. CityOfOntario: $500 is the maximum we will pay. But now remember that if transparency existed now, then it also existed in the past. To tell the truth, I can't really argue with this particular scenario. Contracts often have clauses that state that the buyer must get the lowest price, but there's not a good way to enforce it. Who can argue with transparency here? But here's where I begin to have a problem. Why would the Securities and Exchange Commission get involved in this scenario? Simple - HP (and Dell) are publicly traded companies, and there are strict controls on what they can say, and what they cannot say. Usually a publicly traded company will report its earnings for the entire company, or perhaps for certain large divisions, but the profit/loss statement of small individual units is usually not public information. Any territory manager who provided such information would be guilty of leaking trade secrets. In short, there are legal limits on transparency. So it's ludicrous to talk about transparency for a purchaser, when the seller is legally prevented from being equally transparent. If you've looked at organizational dynamics, you realize that conflicts are not easily resolved. Take the current dispute between the National Football League and its referees. Some will argue that if the referees want $x and the NFL only wants to give $y, they should just split the difference. Life doesn't work that way. Tune into Sunday Night Football, where you can not only watch the game, but can also try to predict how the replacement referees will score it? Can you predict what will happen? What outrageous stunt will the refs pull next? Tune in to NBC and be the first to find out! From the NFL's perspective, providing pensions to the (part-time) referees may set a precedent toward benefits to provide to other NFL and team employees, and may even result in a push by the players to get better benefits for themselves. A Las Vegas casino took an unusual step Wednesday and offered refunds to gamblers who lost money when the Seattle Seahawks beat the Green Bay Packers on a controversial touchdown at the end of Monday night's game. Derek Stevens, owner The D Las Vegas, seized on the attention being paid to the much-derided decision by replacement officials handling the NFL game and became the only casino in Las Vegas to offer refunds. Now the replacement refs are costing someone real money. Lots of it. And even if the mob is out of Las Vegas, there are a number of (using Tony Bruno's phrase) "degenerate gamblers" whose winnings or losses were affected by the replacement referees. And don't kid yourself - gambling matters to the NFL. Why else would the NFL require teams to publicize the injury status of their players, despite the fact that this provides competitive intelligence to the opponents of the teams? Money talks. And if the replacement refs continue to affect the degenerate gamblers, there will be huge pressure to settle this dispute. From #apmp to Sunday school - what should be on our presentation slides? Recently, much criticism has been levied at PowerPoint's default structure of a topic-phrase headline supported by a bullet list of subtopics. This web page advocates an assertion-evidence structure, in which a sentence headline states the main assertion of the slide. That headline assertion is then supported not by a bullet list, but by visual evidence: photos, drawings, diagrams, graphs, films, or equations. Whether you are a disciple of Professor Alley or an advocate of the traditional approach to PowerPoint (load every word you're going to say onto the presentation itself), everyone agrees that the reason that you show slides is because you want people to remember what is on the slides. But how do you make your slides memorable? Lessons can be learned from your local Lutheran Church. When you have those PowerPoint slides whirling by, you have to figure out what to put on them. And in this case, the pastor's question is the same as the salesman, the process champion, or any business person - what do I put on the slides so that my audience will retain my message? In his study he set out to prove that the use of pictures on a PowerPoint during a sermon would actually increase retention and comprehension. He set forth to argue that we have become a visual culture and that the use of pictures within a sermon would increase retention because it would evoke the sense of the eyes and emotions of the listener. But guess what? Pastor Meyer was wrong. Sermons with ‘pictures only’ in the PowerPoint were least effective. Sermons with ‘words only’ in the PowerPoint were the most effective. There's an important lesson here, whether you're "selling" Jesus or you're selling an automated fingerprint identification system. If someone is going to be speaking, the speaker should be the focus, not the slides. The slides should complement the speaker's message, not distract from it. If you are going to use images, keep the images very simple. Make sure the images tie into the business case. Project business materials that are being quoted. Acknowledge the slide/Make the connection with the business case. Various things are bought and sold for a price. My employer sells automated fingerprint identification systems, and government agencies buy them at particular prices. United Airlines sells seats (and food, and baggage transportation, and other things), and passengers buy them at particular prices. Apple sells phones, and people buy them at particular prices. One pricing strategy does not fit all. Think of the concept of a "reverse auction" in which, rather than prices going upward until someone can buy something, prices go downward until someone can sell something. Reverse auctions work better in some instances than in other instances. An airline seat or hotel room has zero value if is not occupied, so there's an urgency on behalf of both the retailer and customer to cut a deal. The customer wants to occupy the room (or seat) on a specific date (or, at least, within a narrow date range). The merchant wants to sell the room (or seat) as a potential profit will be quickly transformed into a cost if it's not filled. The problem with any differentiated pricing strategy (such as dynamic pricing) where there is no compelling reason to buy is that you've just provided the smart customers with an opportunity to sit back and cherry pick the products they want at the lowest prices. I'm sure that management consultants have 3 or 5 or 7 or 99 different variables that enter into a pricing strategy, but "freshness" of the product clearly has to be one of them. Vegetables and desktop computers have different shelf lives. Yes, we're becoming more impatient. Yes, this is powerful. With just one click, you can now endorse your connections for a skill they’ve listed on their profile or recommend one they haven’t added yet. For example, if I wanted to endorse Awad for blogging, I could do so even if he hadn't listed blogging as one of his skills. In my view, LinkedIn differs from most social networks. While Facebook and FriendFeed and Google+ and Twitter can really be used for any purpose, LinkedIn is really tailored more toward business use. Theoretically, I could use LinkedIn to talk about non-business stuff, but the community would pretty much frown on that. Because of this, I see business endorsements on LinkedIn as being more powerful than business endorsements on Klout. Still waiting to see Jason Alba's take on this. I've seen a recent spike in traffic on a 2009 post that described how watermelon can be used to make ethanol. So I thought I'd see if there had been any further progress in this area. That's when I ran across this press release that happened to mention both watermelon and ethanol, but not watermelon ethanol. MOORESVILLE, NC – September 12, 2012 – NASCAR Camping World Truck Series rookie Ross Chastain returns to the Iowa Speedway for American Ethanol 200 presented by Hy-Vee on Saturday evening. The NCWTS last raced at the track just east of Des Moines, Iowa back in June and Ross and the SS Green Light Racing team finished sixteenth; he and the entire team are looking for a better run in the Watermelon.org / Magnuson Hotels Toyota when the trucks hit the pavement in Iowa on Saturday night. For those who don't follow racing closely, it should be noted that both the races and the racers often receive sponsorships. In this case, the race itself is named the "American Ethanol 200" (although I'm not sure how Hy-Vee is connected to this), and one of the racers is partially sponsored by watermelon.org. The NWA supports the industry's research needs through scientific grants to numerous universities and other organizations each year with a keen focus on the highest research priorities. Disease research (i.e. vine decline, phytophthora, gummy stem blight, etc. ), farming improvement research (i.e. plant grafting), and value-added research (i.e. ethanol) are examples of the NWA's investments that will provide answers and support to the industry's needs. But throughout all this, I was unable to answer one basic question. What fuel did Ross Chastain use in his truck? Perhaps you saw my post from yesterday evening - Dear @VZWSupport - there are better ways to cure Android FF1 update USB problems than a factory reset . The post described the problems - and the temporary workaround - that I encountered after updating to the latest version of Android for my Samsung Stratosphere smartphone. After the update, many people have encountered problems with USB transfers to the phone. I have implemented a temporary solution to this, namely putting the USB connection in debugging mode temporarily when I want to transfer data. I have not performed the permanent solution, however, which involves performing a factory reset to my phone. Links to my blog posts are automatically sent to Twitter (via NetworkedBlogs), and the text of my post titles appears as the text of the tweet. Therefore @VZWSupport was aware of my post, and a representative replied. Obviously Verizon Wireless has people who are monitoring mentions of their brand, and these people actually take time to respond. However, I didn't believe that my issue was resolved, so I replied back. @VZWSupport Not resolved. Not good to go into debug mode on a Stratosphere to transfer files, or to do a factory reset after an OS upgrade. Now I haven't researched to see if Samsung truly recommends a factory reset after a software update. I couldn't find any such statement at http://support.verizonwireless.com/pdf/system_update/statosphere_instructions.pdf, and the Samsung Stratosphere support page doesn't even list the latest update; the only item available for download is a USB driver from March of this year. Unfortunately, this has the potential for massive finger pointing between the service provider (Verizon Wireless), the phone provider (Samsung), and the operating system provider (Google, or maybe it's Samsung, or maybe it's Verizon Wireless - hard to tell in these cases). I will continue to update if circumstances warrant. Phishing is a lucrative business. If it weren't so lucrative, people wouldn't take the time to perform it. While phishing doesn't take a lot of effort, it does take some effort, and the phisher needs to get a positive return on investment. Often, he/she does. One morning, I received an email from a former co-worker's private email account. For some inexplicable reason, my employer's mail filters directed this email to my junk mail folder, instead of my inbox. I can't understand why, though, since my former co-worker wanted to share some wonderful information with me. The email included a link, preceded by this text. "Odd," I thought. "My former co-worker is a very intelligent person, and usually she writes in complete sentences. Maybe she's sick or distracted and isn't able to write to her usual standards." My eagerness to click on the link that she provided was overridden by my concern for my former co-worker's health. I went to her Facebook account to see if she was ill...and discovered a message from her saying that her email had been hacked. Imagine that! Who would have guessed? Seriously, the one thing that is disappointing about phishing attempts is that so many of them are written so poorly. Samuel Kofi Atta Mills sends faxes in ALL CAPS. My former co-worker has apparently forgotten to use ANY caps (or periods). Yet in some cases these phishing attempts work extremely well. Take a step back and pretend that you had never seen one of these things before, and weren't aware of the dangers. Now be honest - if a good friend of yours sent you a link and said that it was awesome...wouldn't you click on it? But imagine how many people would click on these links if the phishers just took the time to write their messages in proper English. But there's an even greater danger. This is possible, and it may even be possible to automate it. Then we're really in trouble. Yesterday at lunch when I was getting ready to play NTN Buzztime trivia, I got a message on my Samsung Stratosphere phone saying that an Android update was available. Once I confirmed that the message was a legitimate OS upgrade, I went ahead and started the procedure. I subsequently found out that this upgrade was announced in August and has slowly been rolling out to Stratosphere users. but thought nothing of them...until the time came to transfer my recently purchased MP3 file ("Once in a Lifetime" by Wolfsheim) to my phone. When I got the error message again, I belatedly realized what that process was. Among other things, it was the process that enabled the USB connection between my netbook and my phone. I tried manually going through the Settings menu to the USB item...and got the same message. Then I began wondering if other Samsung Stratosphere users on Verizon Wireless were encountering the same problem. It turns out that they were. The only way I can download/upload between is to remove my SD card and load it directly to my computer. If anybody has the same or any other problems, please post. Hey VZW... how about a solution!!!??? And that was just the first post in the thread. Other people were encountering the same problem - enough to make one wonder if Verizon Wireless had totally tested this update before sending it out. So far, this particular thread has only had one comment from a Verizon Wireless cmployee. The employee was positive and helpful, but I'm not all that enthused about the suggested solution. Let me know if this resolves your USB problems. Have a great day. Frankly, if I have to execute a factory reset after updating my device...I'm not going to update my device. And others in the thread agreed. Luckily, there were less nuclear options in the thread, and one of them worked for me. Basically, what I had to do was to make sure that my phone was not plugged in, go into my Settings, go to Applications, go to Development, and then temporarily enable USB Debugging. After that I plugged my phone into the USB cable, turned USB debugging off, waited a bit...and then was able to mount the phone on my computer as a USB storage device. As I write this I have no idea whether I'll still get these messages in the future, but at least I have a workaround. If you'd like to see a step-by-step process on enabling USB debugging, see IT Jungles. Now I can listen to Wolfsheim on my phone...and I'm wondering whether Verizon Wireless is going to release a new update, or just tell people to perform a factory reset. I wrote something in my Empoprise-MU music blog last August, with the intention of writing a follow-up to the original post. Well, I'm finally getting around to the follow-up. But there's one thing that unites all of these new versions of old songs. In my opinion, these new versions are better than the originals. Vocally, the Beach Boys blew Chuck Berry out of the water, and the instrumentation was more inventive. And while I have personal problems (religious issues) with Harrison's lyrics, I love his guitar work from that period. "Roll Over Beethoven" has been recorded in many different versions, but the one from the Electric Light Orchestra stands out as a successful attempt to marry classical and rock music. And Kanye (while I again have issues with some of the lyrics) is a much better singer than the Dafts, and again he provides better instrumentation. Now you may disagree with my particular musical tastes, but I'm sure that you can think of examples in which an artist takes an original work and improves on the original. Some would think that this is not possible, and that the original artist (say, Bob Dylan with "Knocking on Heaven's Door") had all of the inspiration, genius, and talent, while the subsequent artist (say, Guns 'N Roses) had none of the above. But I maintain that this is entirely possible - and expected. Why? Because the second artist who comes along doesn't have to do any of the heavy lifting. Much of the work was done by the first artist, freeing the second artist to apply his or her own creativity to the work. For example, Brian Wilson didn't have to worry about coming up with a melody - Chuck Berry had already done that - and he could therefore pay attention to the lyrics. This same principle applies in business, which is why I'm writing about it here. Consider a future device for individual use, which is a sort of mechanized private file and library. It needs a name, and to coin one at random, "memex" will do. A memex is a device in which an individual stores all his books, records, and communications, and which is mechanized so that it may be consulted with exceeding speed and flexibility. It is an enlarged intimate supplement to his memory. - Vannevar Bush; As We May Think; Atlantic Monthly; July 1945. But Doug Engelbart built upon Bush's work, and Alan Kay and others built upon Engelbart's work, and Jef Raskin (remember him?) and others built upon Xerox PARC's work, and Bill Gates saw the Apple stuff at some point, and so forth. As I write this, I am looking at a screen with a number of boxes with text in them. These buttons have words like "Publish," "Save," "Preview," and "Close." There are also other buttons visible to me; some have single letters such as "B" and "I," while others have pictures of things such as a flag or a battery with a power plug next to it. The screen that I am viewing in 2012 is not in any way what Vannevar Bush envisioned in 1945, but each of the people who followed Bush built upon that foundation and were therefore freed to make other improvements. And if you're a purist who argues that the original inventor is best and that the followers are untalented copycats, then I encourage you to throw away your computer (or your phone) and buy a really large desk with translucent screens that is able to manage your records (78 or 45). Enjoy. There are roughly 80 thousand governments within the borders of the United States. This includes the Federal government, the 50 state governments, and a vast array of local governments, including over three thousand counties and over 13 thousand school districts. During the late 1990's, with the rapid growth of the Internet and email, Washington's all-news station, WTOP Radio, noticed that a tremendous amount of correspondence was coming from addresses with .gov and .mil extensions. Many of these emails were requesting more federally-focused content. At the same time, the number of companies advertising on WTOP to reach federal decision makers was increasing rapidly. On February 22, 2000, FederalNewsRadio.com, the world's first, Internet-only, all-news radio station was born. Our focus was, and still is, the federal community. Federal News Radio moved onto the radio airwaves on 1050 AM in 2004. In 2008, it moved again to a clear channel1 50,000 watt station on 1500 AM. To my knowledge, there is no radio station dedicated to state government news in cities such as Sacramento, Albany, or Tallahassee. But perhaps such radio stations are on the way. P.S. As an aside, this is post number 1,800 in the Empoprise-BI business blog. That's a lot of business. A sports team that is a member of a sports league is beset by conflicting priorities. As a team, its goal is to beat all of its competitors. But as a league, its goal is to ensure the viability of the entire league, thus providing financial security to itself. In Scotland, the Rangers football (soccer) club has faced financial challenges. After being more than 100 million pounds in debt, the club was placed into administration, and its assets were purchased. The entity that purchased the assets then applied for membership in the Rangers' former league, the Scottish Premier League (SPL). RANGERS and a breakaway group of SPL clubs were last night on the brink of a compromise deal which would secure the Ibrox club’s place in the top flight. [The clubs] have been warned as much as £15million could be wiped off the value of their deals with Sky and ESPN if Rangers are frozen out of the SPL for more than one season. Already they fear being denied the £645,000 they are each due to receive from the TV companies on August 6. And without that revenue and additional slices of the financial pie later in the year it is feared several SPL clubs, perhaps including Kilmarnock, Motherwell and Dundee United, could be facing closure. So it was in the clubs' financial interest to keep the Rangers in the SPL. An SPL statement read: "At today's General Meeting, SPL clubs today voted overwhelmingly to reject the application from Rangers newco to join the SPL." The relegation of Rangers to the Third Division of the Scottish Football League will have cut income. Although Sky do not comment on the value of the five-year deal it is being suggested the sum paid out has dipped from around €20 million a season to €16 million. There is sure to be a further impact on the Scottish Premier League since the Rangers away support now travels to different grounds. At such a moment, it is wise to remember once again the term “Old Firm” is a scornful reminder the clubs are business partners as much as rivals. The relationship has been as lucrative as it is claustrophobic and Celtic chief executive Peter Lawwell might pine for absent Rangers, even if he could not say so in public. If Rangers liquidate and a newco/Phoenix club gain entry straight back into the league; this is a kick in the teeth for the premise of fair and true competition and the whole ethos of what football is about. 1000s of fans of other clubs will simply give up – as there is no value in cheating and straight away having the slate wiped cleaned! The club’s lowest home attendance this season was just under 30,000; a figure 90 percent of the SPL can only dream of. Because of other things going on in Scottish football, it is currently not possible for Rangers to rejoin the SPL until the fall of 2014 at the earliest. Rangers would need to be promoted twice to reach the top level again. If they can do this, would the SPL welcome them with open arms? And would Rangers want to rejoin the SPL? As of now, Rangers and SPL are not on the best terms. On Monday, I wrote a post about a fax (!) scam that purported to be from Samuel Kofi Atta Mills, the son of Ghana's late President John Atta Mills. Samuel, according to the fax, had US$95 million that he wanted to invest in my country. The scam is a strange story in itself - but Samuel Kofi Atta Mills' real life is even stranger. In my prior post, I quoted from a BBC article that discussed Samuel's parents. He is married to Ernestina Naadu Mills, a director of education and trained marriage counsellor. The former second lady-turned-first lady is also a dog-lover who has kept cross-bred Alsatians. The couple have one son, Sam Kofi Atta Mills. He leaves his wife Ernestina Naadu Mills, a trained marriage counsellor, and their son Sam Kofi Atta Mills. I took the articles at face value - who am I to question the British Broadcasting Corporation? The article included no other information about Portia Awuku, and mostly concentrated on a number of protocol lapses that occurred during the funeral. On that same day, Sam Kofi Atta Mills’ mother was the first time seen with her son in public. The mother, Mrs Portia Awuku was seen in mourning attire standing by his son. Apart from that she was not part of the funeral ceremony in anyway. PS: Please note that Samuel Atta Mills’s mother’s name is Ruby Addo and not Portia Awuku as stated by The Publisher above. They said he would be reading a tribute during the funeral at the Independence Square so he was to rehearse the reading and get used to the protocol arrangements and the gentleman went for the rehearsals. He even continued the rehearsals on the vary day for the funeral and was really looking forward to it but for some strange reasons, he was not allowed to read it. After all that, Samuel held his own funeral service for his father. On Friday, night Samuel Kofi Atta Mills, was said have called his friends and relations, mostly from his mothers side and held very private but touching funeral service at his residence near Roman Ridge in Accra. "He (Samuel) didn’t perform his own funeral; nothing prevents one from also organizing a small get together and inviting friends." And I'm only touching on the tip of the iceberg about the bizarre events surrounding the real Samuel Kofi Atta Mills. Click the links that I've provided above for more oddities. Oh, and just to complicate things further, the CIA notes that Ghana will hold a new election in December of this year. John Atta Mills was elected in 2008 (after several tries) with barely 50% of the vote. And if the current government is dissing his son, that may be enough to disrupt a razor-thin majority. Perhaps the Ghana government will pay Samuel Kofi Atta Mills US$95 million to leave the country for a few months. P.S. Ghana politics seem to be like the U.S. politics of 1800. Check this article which mentions Ernestina Naadu Mills, along with "the Whiteman" who gives Jaguar cars in exchange for land. I'm still amazed by this. I've been writing on the Empoprise-BI business blog for several years now, and I still get a significant amount of traffic from people with problems with their KitchenAid oven temperature probes. And this traffic is all because of my November 2009 post "Remove probe? It's hard to find a kitchen aid at KitchenAid.com" and my October 2011 post "Kitchen Aid oven 'remove probe' problem revisited." For those who haven't heard of the issue, a little explanation is in order. Certain KitchenAid ovens allow you to use a temperature probe to see if the food that you're cooking is ready. Occasionally, the KitchenAid oven asks you to remove the temperature probe - even when no temperature probe is present. The common solution to this problem, according to howtomendit.com, is to remove the moisture that is somehow interfering with the temperature probe connection. Select models include a temperature probe that monitors food temperatures and prompts the oven to signal when the desired food temperature is reached. The temperature probe in our convection oven makes it easy to get perfect roasts every time. Set the internal food temperature and insert the electronic temperature probe. Once the desired temperature is reached, the oven will turn off. And sometimes, not turn back on. But the KitchenAid website apparently still doesn't discuss that. Hey, an Oracle OpenWorld post - even though I haven't been to Oracle OpenWorld since 2009. Despite my job change, I still monitor all things Oracle, and I saw this Oracle PartnerNetwork item on Facebook. Last year, there were 63,072 chairs used during Oracle OpenWorld. Can't wait to see them filled again this year! And I...well, I couldn't help myself. I had to ask a question. How many bean bag chairs? For those of you who don't know, bean bag chairs at conferences such as Oracle OpenWorld have been an interest of mine for years. Here's a post that I wrote on the topic back in 2005. I doubt that the Oracle PartnerNetwork person knew of my odd fascination with the topic, but he/she promised to follow up with an answer to my question. Monitor this thread on Facebook if you're interested in the answer. Who says all investment offers from Africa are scams? I received a fax from Samuel Kofi Atta Mills which I almost threw away - until I investigated it. Now I know what you're saying. You're saying to yourself that this is obviously a scam, and that "Mr. Mills" will eventually ask me to deposit money in good faith, and that once I stop sending money I'll never see "Mr. Mills" again. Well, I did a little bit of research with the BBC, and here's what I found. First, Ghana did have a President with the last name of Mills - John Atta Mills - who passed away on July 24. Sam is also mentioned here. So this offer that was faxed to me is obviously legitimate. Now I realize that a 2009 email reportedly from Sam was not legitimate, but that email had a Hong Kong address. This fax listed an email that was with a domain in Kazakhstan - and that's pretty close to Ghana, isn't it? And the fax number listed was for country code 27, which is in South Africa. Everybody knows that South Africa is in Africa, which is real close to Ghana. Presumably Sam didn't trust the people of Ghana with the $95 million, so he went to the town of Kazakhstan in South Africa where it was safer. Obviously I'm not going to give you any of the specific details, such as the exact email address or fax number, or the information that Sam wants me to send to him. After all, he addressed the fax to me, so it's my $95 million. You may call it greed; I call it shrewd investing. So GoDaddy went down this morning, and at the time some people speculated that it was a takedown by Anonymous, allegedly because of GoDaddy's initial support of SOPA (which it later reversed - I guess Anonymous didn't get that far in its research). Some people think that this would be a really good time for competitors to tout their services. But there's no good way to do it without the competitor looking bad itself. This was followed up by several other tweets with a special offer (with promo code reliablehost). Now consider the ramifications if it turns out that GoDaddy was truly shut down by malevolent forces intent on taking it down. Does this mean that HostGator supports such tactics? @hostgator @lordofseo given hostgators performance lately I'm assuming that's an ironic hash tag? @lordofseo yeah, we have had issues as have some of our clients. Moving everything off. Of course, I may be making too much of HostGator's sleazy advertising techniques. After all, HostGator wouldn't be the first domain provider to use sleazy techniques in advertising. A food truck funded through Kickstarter? That's only half the story. I live in the Inland Empire of California, where food trucks are often newsworthy. They're primarily newsworthy here because they are (last I checked) illegal. Well, they can park at specially organized events and sell their wares, but they can't just drive around from door to door and sell their gourmet foods. Part of the reason is competition - stationary businesses who operate restaurants don't want food trucks parking right outside their doors. That problem does not exist in France, where one truck takes special precautions not to anger their neighbors. Currently, the unfinished truck parks up a few days each week at farmers' markets and area villages where there are no restaurants – a deliberate strategy that makes the truck a non-threat to local businesses and a welcome addition to the community. Foods served include small tapas and snacks like home-made focaccia bread. But there's something unusual about this particular truck. The two American entrepreneurs who run this truck funded it through Kickstarter. Much of the funding for the truck renovations was achieved through crowd-sourced contributors after Lillard pitched the idea on start-up website Kickstarter,and through her blog, Twitter and Facebook. In the end, 92 backers pledged $8,206 for the project, exceeding her $7,500 goal. Oh...and there's one more thing about this particular truck. While it serves food, it's not strictly a food truck. An American couple living in southeastern France are stirring things up in their sleepy town with the launch of the country's first mobile wine truck. It wasn't intended to be a subversive move, says Amy Lillard, a Colorado native. But selling wine out of a truck presented an easy and innovative solution to a logistical problem: the fact that she and her husband, Matt Kling, had no space to build a tasting room for their winery, La Gramière, in the Languedoc-Roussillon town of Saint Quentin La Poterie. So instead, the couple came up with the idea to take their wine to the consumer. Yes, you read that correctly. This truck is actually a wine truck. So far Lillard and King have not been deported. Read the story here. Or read the La Gramiere blog (in English) or visit the Facebook page (in French and English). When should a business not use the business model? Recently I've written two posts about the use of the business model by entities that some do not consider businesses. Most recently, I wrote a post that implicitly referenced the model of a church as a business serving consumers (church attendees), and the understanding that a church was therefore obligated to meet the needs of its consumers. That's a topic for another time. I stand before the graduatating class of Nonexistent University. As you leave these hallowed halls, I trust that you will remember the valuable lessons that you learned here. I could speak of the love of learning that you have received at this institution, or I could speak of the value of the pursuit of knowledge. But I will not speak about that. I could speak about the non-academic aspects of your time at this university. The long talks at two in the morning. The wild parties. That night in that co-ed's room that you thought that no one knew about. But I will not speak about that. Because, as you leave these hallowed halls, you will learn what is important. And it's not knowledge that's important, and it's not the college experience that's important. What's important is that this university has to make money, however it can. When you evaluate a university in business terms, then you use certain metrics in place of others. Now some may argue that a school should be measured by the number of Rhodes Scholars, but we all know that a school should be measured by something far more important - its endowment. [T]he business model, which prizes “customer satisfaction” or “efficiency” above all else, has led in higher education to an imbalance in the relation between student and institution, has led to a culture of entitlement and instant gratification, and has causal ties to the current fiscal crisis. Currently the nation faces an economic crisis the likes of which most of us have only had nightmares about. We as a nation have the lowest savings rate and highest personal debt of any industrialized nation. We have been taught for more than 30 years that we are entitled to get what we want when we want it. The sub-prime horror has been a result of a sense of this entitlement which pervades society at all levels: the top, the middle, the bottom. I suspect, however, that the problem is not with the business model. The problem is with the application of the business model - namely, the timeframe used when making business decisions. It's a fact that company executives (and church leaders and university governing bodies) will make different decisions based upon the timeframe in question. If your goal is to maximize profit during the next fiscal year (or the next twelve months of offerings, or the next academic year), then you'll make one type of decision. If your goal is to meet your numbers for the months, you'll make a different decision. But if your goal is to maximize the value of your company (or church or university) over the next fifty years, your decisions will be different. Of course, one problem with making long-term decisions is that you are making them based upon really bad information. Let's say that you were a state planner in Cuba in the 1980s, and you were trying to chart the future of the country over the next fifty years. Let's say that you were even able to make some intelligent assumptions about what would happen to Cuba in the years after Fidel Castro. But could any Cuban planner have predicted that in 1991, both imports and exports would drop by 80 percent? But what if there is a chance that the program may attract throngs fifty years from now? Is it worthwhile for a university to continue a course of study on the chance that it may become relevant again? Under Dr. Katopes’ leadership, the College has attracted funding support for a wide-range of programs from both government sources and private foundations. Working closely with the College’s Department of Mathematics in 2008-09, Dr. Katopes helped garner over $4 million in grants from the U.S. Department of Education to support experimental pedagogies that have improved students’ basic skills math scores. I hope he refused the money. You can't sully the image of your institution by allowing yourself to be bought by the Federal Government, you know. Jim was a salesman who was looking to be sold on something. During the working week, Jim always strove to meet and exceed his customers' expectations. But on the weekend, he wanted someone to meet and exceed his own expectations. Because of this, Jim had spend a long time searching for a church that met his needs. He had tried a number of different churches, but none of them was right for him, and pretty much seemed to be a waste of time. But something caught Jim's eye when he heard about the Four Minute Church. The Four Minute Church Meets Your Needs! A church service with only the essentials! You will be equipped in LESS THAN FOUR MINUTES! It was a forty-five minute drive to get to the church, but Jim felt that it was worth a try. He left early on a Sunday morning, and had arrived at the Four Minute Church by 9:45. He got out of his car and joined the other people who were walking from the parking lot to a very impressive structure. Jim found a place in a pew and waited, looking at the altar and decorations. On each side of the altar was a large digital clock that showed the hour, minute, and second. At 10:00:00, a door to the side of the altar opened, and a familiar man in robes walked in. Jim recognized the man but didn't know his name. The man spoke the Lord's Prayer. Rapidly. Then he walked out by the same door that he came in. Most of the congregation sat in silence, waiting to see what would happen next. But then they noticed a few people in the back were starting to get up and head for the door. Before they reached the door, they heard a car starting up in the parking lot. Jim looked around him as a few more people slowly got up to leave. Eventually, Jim and the rest of the first-time attendees realized that the service was over. Rather than heading out the door with the others, Jim decided to follow the pastor and ask what was going on. He went to the door by the altar to find the pastor's office...but the door led directly to a side parking lot with a parking space for the pastor. It was empty. Jim walked around to the main door of the church, and noticed a man writing on a sign that Jim hadn't noticed before. The man was writing the date, and the number "22" next to it. Dates for prior weeks were also written on the sign, along with other numbers: 35, 28, 24, 41, 25, 49. The man finished writing, turned around, looked at Jim, and smiled. "Hello, newcomer," the man said. "Did we meet your needs? Or did we exceed them?"